You created 3 questions as your hook for an essay. Good job. The “Hi, Brock McMillen here!” should not be used. “This invention is the best thing since sliced bread!” is a good sentence. It may be a bit cliche, but it gives your writing more personality. Try not to use common sayings though . . . Maybe something like this is the best thing since the I Phone 4 . . . just an idea. Good attempt at re-writing your thesis. Your thesis sentence needs to be very clear and direct. You do label what you will be talking about in your three body paragraphs which is good, but the first part of your thesis sentence is unclear. For example, a better thesis might have been . . . “The PS360 is important, has a wide variety of uses and can work with all types of games.” See how it is very clearly talking about the PS360? Not much changed from your first essay to your second essay. Make sure you go over every comment and try and improve your essay as a result. The changes you did make were really good, I would like to see more of that. Avoid exclamation points. I understand that you were trying to encourage people to get interested in your product, but exclamation points should rarely be used in essay writing for school. Great job Brock, your next assignment is attached to this email. Great job on the last assignment. Here are my comments. 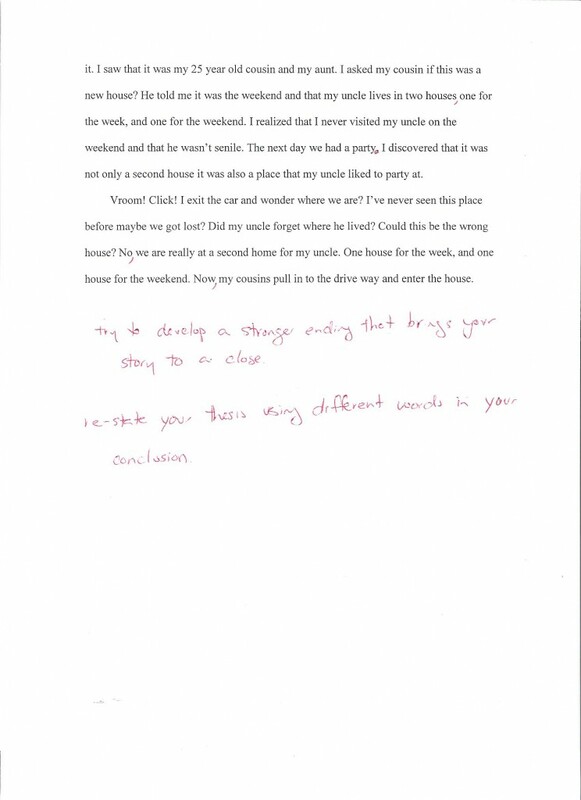 Although your thesis wasn’t perfect you made it very clear what your essay and your paragraphs would be about. One way to improve your thesis is to make sure that your thesis sentence is as clear and direct as it could possibly be. In your conclusion you re-stated your thesis in a very clear manner. That is a great way to reinforce what it is your essay was about. Good job! I like the ending to your essay. “Go and challenge your friends today!” could be a good one too. 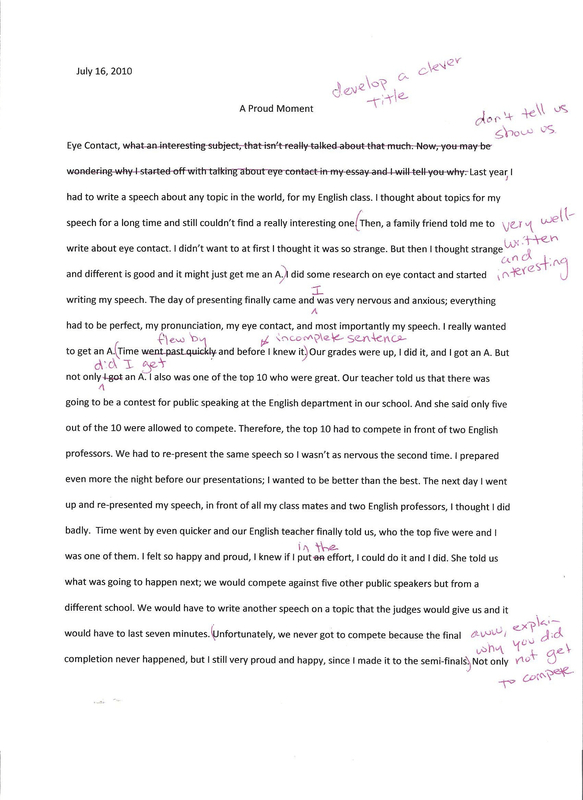 Throughout this program, I try to teach you different techniques to improve the tools that you have to write a good essay. For this assignment, try starting with a question “hook.” Start your essay by immediately stating three questions . . . maybe something like . . . “Are Xbox gamers really better than PS3 gamers? Who would win the ultimate challenge? How would we find out who was better?” Just a suggestion, feel free to write your own questions. Try to include more information in your body paragraphs and be sure to clearly state everything that can support your answer. For example, your first paragraph would be written about why it’s important. Then you should think of every way that this invention could be important and include that information in your body paragraphs. Continue that for each body paragraph. Don’t use things like “in conclusion” . . . it’s not necessary and detracts from your writing. 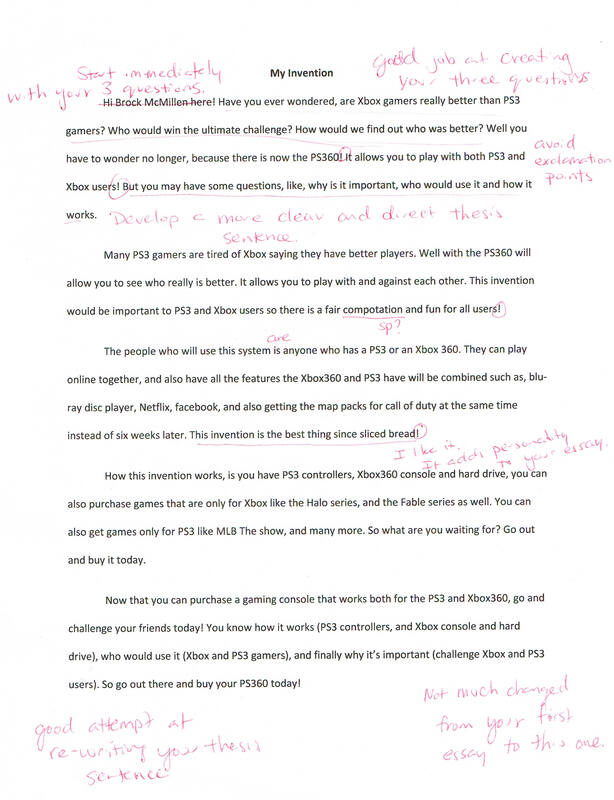 Overall, great job Brock, I look forward to your re-write. Thank you for re-writing the assignment. You used some advanced vocabulary during your writing sample. Surreal is a great vocabulary word and you demonstrated it’s meaning well. Great job at restating your thesis in your conclusion. The only sentence you used in the conclusion is what I like to call restating your thesis. 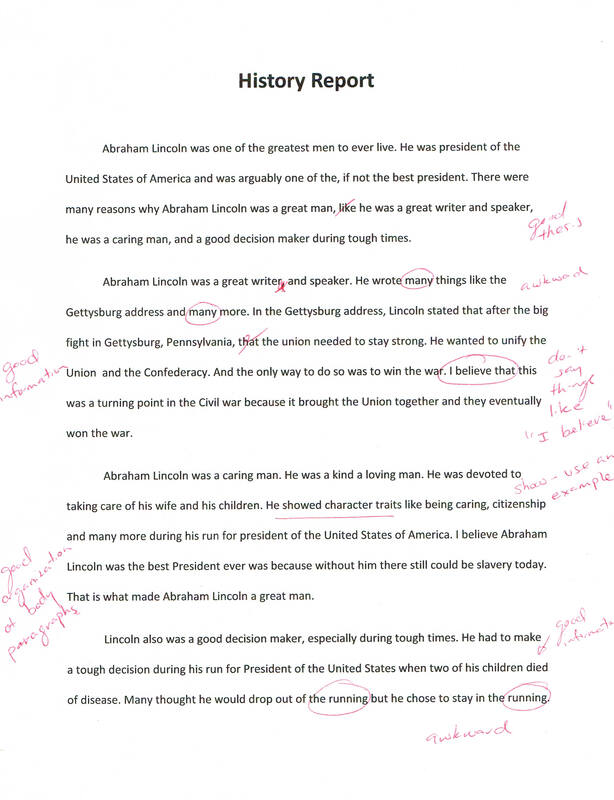 Basically, you are rewriting your thesis, but using different words than you used earlier. However, your conclusion should be longer. Try using a “link” and a “clever ending” to make your essay stronger. Very nice story, it sounds like you had a great time helping your team win the Championships. In every essay you write, you should start by including a “hook.” A hook is something you use to get a reader interested in what you have to say. I have given specific directions in your next essay for how to write one example of a hook. Be sure to follow those directions. Your thesis sentence should be very specific. The last sentence of your essay would have been much better to use in place of “It was awesome for three reasons.” In the last sentence you explained why this was a proud moment and that’s really what your essay is all about. Outstanding job! Your next assignment is attached to this email. Excellent job on your first writing assignment. Thank you for reading the directions and trying your best to follow through on them. This is one of the best first essay’s that I have received so far, so thank you. Each time you submit an assignment I will scan and email you back the essay you submitted along with some things that I point out in red ink. 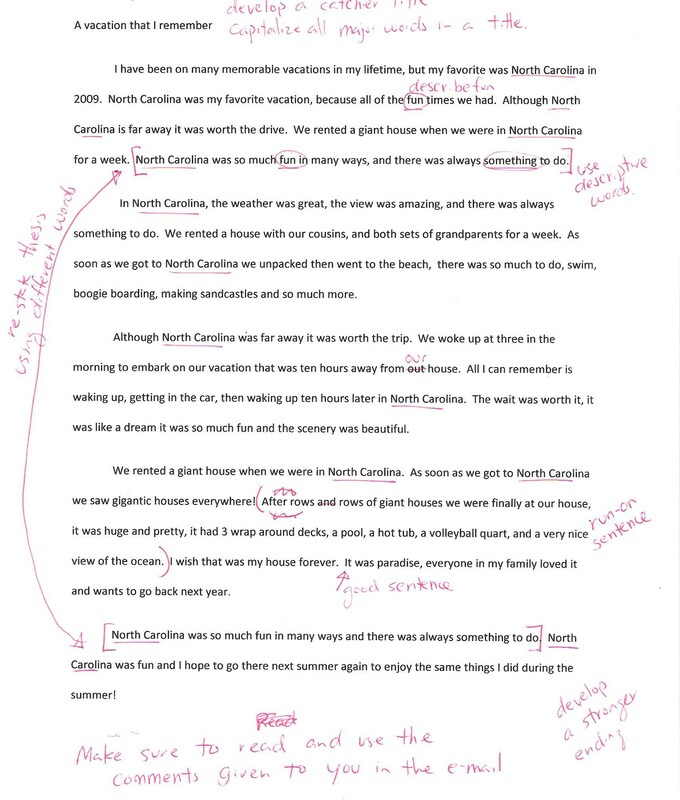 Be sure to look over the places that I marked so that you can make the appropriate corrections later on and also know what you did really well in your writing. I will also tell you three things that you did well and three things that could be improved in your writing. Here are those things now. Your thesis sentence, “It was awesome for three reasons.” is a clear and direct thesis sentence. Although, it is not perfect, it does show that you understand what a thesis sentence is. Many writer’s at your age do not. You can improve your thesis sentence by being very specific. Explain what “it” is and say directly what your three reasons are. The sentence, “It was like going downstairs Christmas morning and seeing all of your presents and getting to play with your new toy.” Examples like this are very interesting for people to read. I can get a real sense about how excited you were to win the Championship. The last paragraph was just one sentence, but the one sentence was very well-written. The sentence you wrote is what I refer to as the restatement of your thesis. 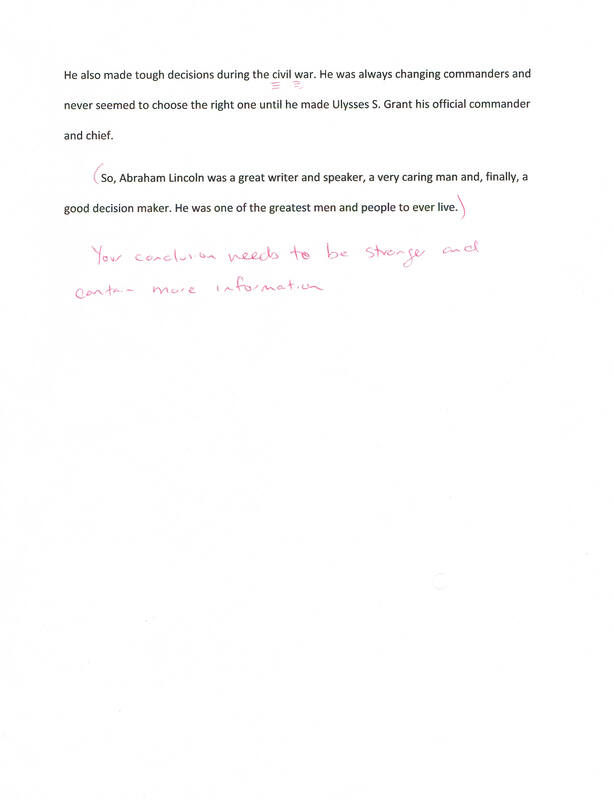 Every conclusion that you write should restate your thesis in a clear and concise manner like you did in this essay. In future conclusions, you should have more than just one sentence; however. Writer’s often use the phrase, “Show me, don’t tell me.” In your essay you were telling me what you were writing about. For example, the first sentence, “I am writing about” and also in every body paragraph you write things like, “The first reason on why . . .” You should not use these in your writing. Don’t tell the reader what you are writing about, simply show them. In every body paragraph you wrote variations of this sentence at least once and sometimes twice . . . “why this was my most proud moment.” I like how you were specific in stating that this was a proud moment, but try different ways of saying that because it becomes a bit redundant. Every essay that you write should try to “Hook” the reader into wanting to read more. Your first sentence should always be as interesting as possible. For this essay, try telling a story that gives people a sense of what the experience was like. So, write a “hook” that uses a personal anecdote (a short story about yourself) at the event you described. Excellent job on your first assignment and I can’t wait to read your revisions. If you need clarifications on anything, send me an email and I will get back to you as soon as possible. 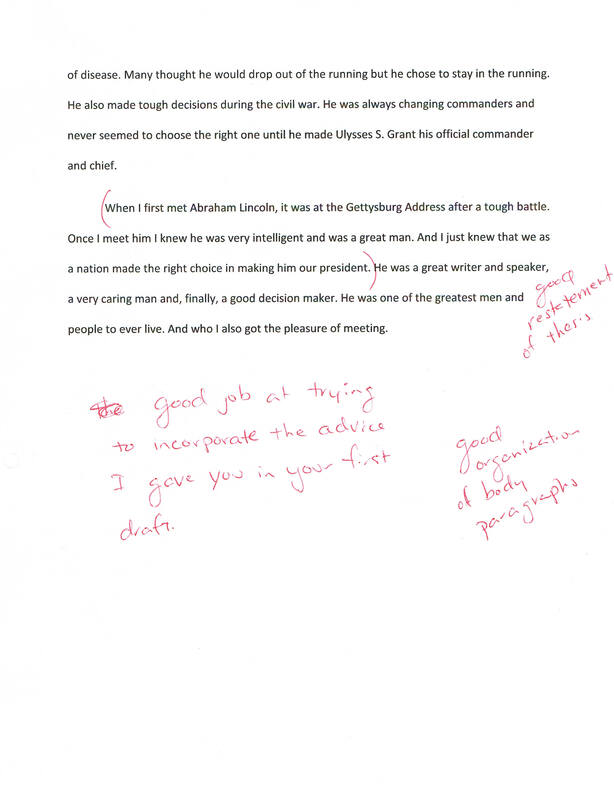 Great job on your first essay! It was truly a pleasure to read. The most effective way to improve your writing is not to overwhlem you with corrections, but to guide you through the writing process. 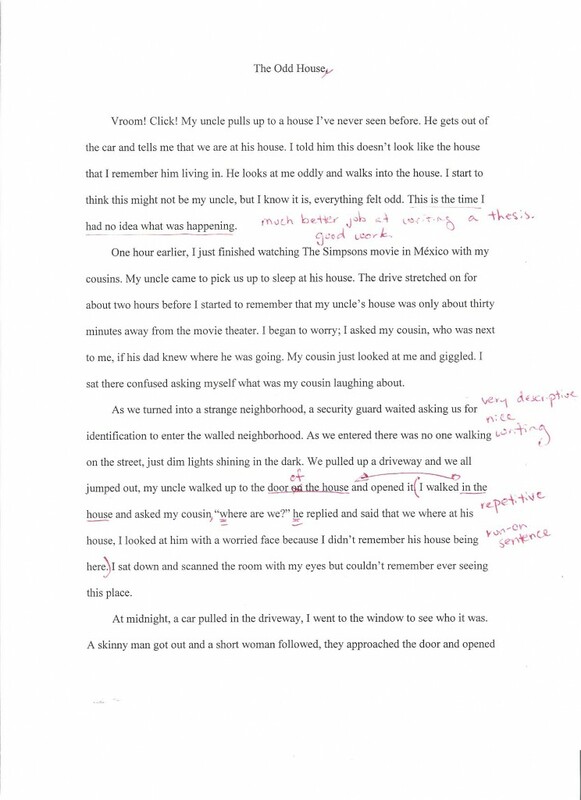 With that in mind, each writing sample that I evaluate will have minor corrections on the assignment itself, which I will scan and send to you. I will also give you three tips on ways to improve your writing and three things that I think you did well. Using paragraphs is extremely important in writing. A paragraph separates main ideas of your story and makes your writing easy to follow for the reader. For this assignment, you need to use five different paragraphs: an opening, three body paragraphs and a conclusion. Go through your writing and separate your story into three different sections and make those your body paragraphs. Use one paragraph to introduce your story and sum it all up in your conclusion. Never write in the essay, or I am going to tell you why you are writing about something. Show the reader why you are writing about something, don’t tell them. You have several incomplete sentences throughout your writing. Try reading your writing out loud, to see if you can catch any of those mistakes. You told a great story. I was interested in what you had to say from the beginning to the end. You made a great attempt at a hook at the very beginning of this assignment. But, I would have started with just the sentence . . . Eye contact. And then continued my story from there. The vocabulary that you used was very advanced. You have a strong writing style and are very descriptive which makes your writing fun to read. Please take the time to look over the suggestions that I have made for your writing, and re-write the assignment making the necessary changes. 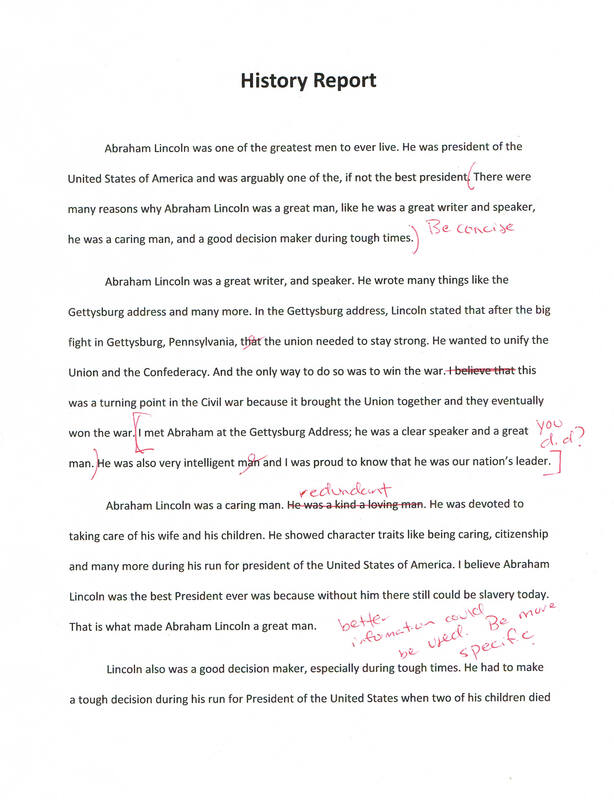 Excellent job on your re-write. Thank you for looking over the comments and using them to improver your writing. Again, you used very descriptive writing and told a good story. Your first three paragraphs were particularly strong. Good job on following my comments and coming up with a thesis sentence. This helps to guide the reader by knowing what your essay is going to be about. 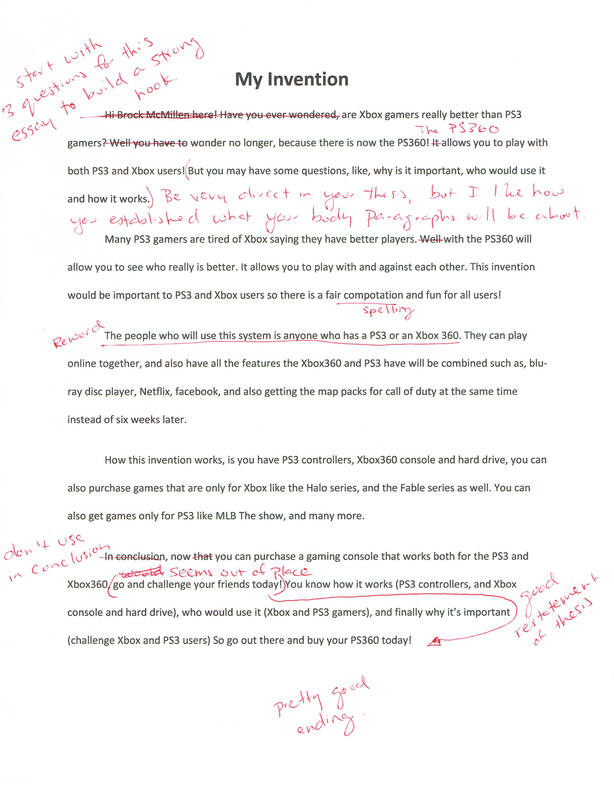 The overall flow of your essay works very well. You tell a complete story from beginning to end and use suspense to help make your story interesting. You had several run-on sentences in your writing. To check for run-on sentences try reading each sentence out loud to yourself and listen for natural pauses that occur when you are reading. Try to develop a clever ending to all your writing, that brings your essay to a strong close. For example, you could have ended the entire essay by saying that this was your Uncle’s party house and said something unique about that. I think that would have made a better ending. Don’t you? Re-state your thesis in your concluding paragraph using different words. Simply by stating that this was a time you did not know what was happening, it reminds the reader what your essay was all about. Good job on your re-write. Make sure you read the comments and use them for your next assignment. You did have some nicely developed sentences in your essay. Great use of vocabulary throughout your essay. It was coherent and you separated your paragraphs much better in this essay than the previous one. Try to use descriptive words in your writing. Words like fun and something should be elaborated on. Why was it fun? What was something? You still did not follow directions completely in this essay. The essay was asking you to discuss three different topics. One of which was your first vacation, but you were also supposed to discuss two other topics. Be sure to follow all directions completely for your next assignment. When you re-state your thesis in the conclusion, be sure to re-write it using different words.